As you’re preparing for your next home or office move, you’ve likely heard of Double Drive Time and wondered what it is and if it’s legal. The answer is Yes, it is legal, and we’re here to help explain it. Look No Further: 5-Star Yelp rated, A+ BBB rated Mover for just $79/hr! Absolutely no other fees! Simply put, it is the round-trip drive time for the movers from the pick-up location to the drop-off location. More explicitly, all California moving companies are required to abide by the laws of the California Public Utilities Commission (CPUC). Within these laws, there are stipulations around what costs can be passed down to customers. For all hourly moves in the State of California, moving companies are required to charge Double Drive Time. Moving Tomorrow? No Problem! Compare 10+ Moving Companies for the BEST PRICES! In the example below, somebody is moving from Point A to Point B. In this case, the round-trip drive-time is 30 minutes [15 minutes from A to B + 15 minutes back from B to A = 30 minutes]. So the total hours charged for the entire move will be 4 hours (loading) + 3 hours (unloading) + 30 minutes (driving) = 7.5 hours total. The CPUC requires all moving companies to use the Double Drive Time Law to protect consumers. 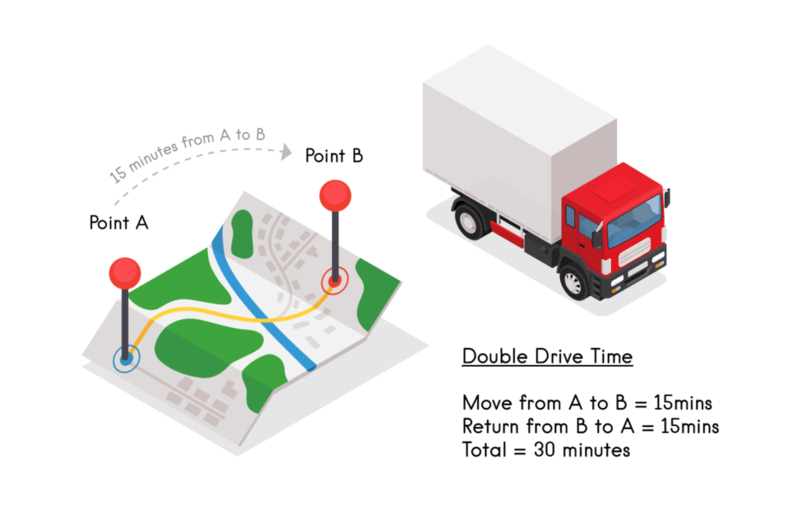 Using Double Drive time provides visibility to the customer of the actual driving costs being paid and it compensates the moving company for their actual driving time, plus the time to return to the origin (where the job started). The customer is responsible for all drive time between the new and old house or office. The moving company is responsible for the driving time between their warehouse and the origin location. Book Now! Compare more than 10 Movers’ Prices, Reviews, and Licenses! Generally the point of origin is considered the home or office you’re moving out of. Generally your new home or office that you’re moving in to is considered the destination. Most moving companies round to the nearest 15 minutes (both up and down). For those that are curious, we’ve included the link to the source on the CPUC website.